A Missouri lawmaker who’s a delegate for Senator Bernie Sanders in Philadelphia says the DNC should start listening to grassroots advocates. Smith says while there is division at the Convention, he expects delegates to be respectful. “And there’s a difference of opinions coming here. It’s not going to be like a big kumbaya moment. In the end, a nominee (Hillary Clinton) will be selected and overall the Democrats will support whoever that nominee will be,” Smith says. Smith says positive things happen when issues are debated. He supports Sanders’ positions on issues like criminal justice reform, private prisons and jobs. “My reasoning for being here (in Philadelphia) is I’m representing the 50 percent of the state of Missouri who selected Senator Sanders, and believed his platform. I’ve been a supporter for awhile,” Smith says. Smith is the lone state legislator who is a Sanders delegate. Smith is finishing his third term in the House. 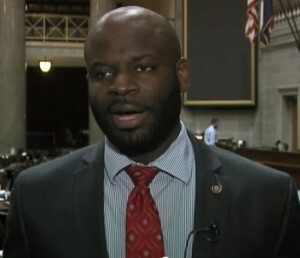 He’s the ranking Minority member on four Missouri House Committees, including the Select Committee on Labor and Industrial Relations. Smith’s district includes a large area near Lambert St. Louis International Airport. Smith tells Missourinet he feels safe in Philadelphia, noting there is a lot of security. He’s seen several protests downtown and has spoken to some of the protesters. The Convention continues through Thursday at the Wells Fargo Center.